Quality education is essential in the economic development of any nation. This fact is clearly evidenced from past experiences of countries/regions such as Singapore, Ireland, Korea, and the European Union during the last five decades. The Gulf Cooperation Council (GCC) member nations have also identified sound educational systems as being the cornerstone of economic progress, and taken several initiatives aimed at improving the quality (and quantity) of education over the last two decades. A new report, GCC Education Industry, produced by investment bank Alpen Capital, foresees that the number of higher education institutions across the Gulf region will grow mainly on the back of rising enrolment rates in GCC member countries. The report includes detailed profiles of the education capabilities of Bahrain, Kuwait, Oman, Qatar, Saudi Arabia and the United Arab Emirates. By focusing on the growth potential of the respective GCC member nations, it presents an outlook for each segment of the education sector: pre-primary, primary, secondary and tertiary education, vocational training, and special education. Further, the report includes detailed profiles and market dynamics of the six GCC nations as well as investment opportunities, merger and acquisition activities, major educational projects in the region, and snapshots of some of the well-known schools and companies operating in the sector. The report contains some fantastic data on the US $65 billion GCC education sector, and is well worth a read. In the meantime, ICEF Monitor has pulled out a few highlights below. The total number of students in the GCC region is expected to grow from an estimated 10.2 million in 2011 to 11.6 million in 2016, registering a CAGR of 2.7%. Earnest intention of the governments to improve the coverage and quality of education in their respective countries through various reform measures such as an increase in public expenditure on the sector. Government spending on education, as a percentage of total government expenditure, across the Middle East and North Africa (MENA) region increased from 12.7% in 1985 to 19.3% in 2008, with particularly impressive increases in the UAE, Saudi Arabia and Oman. An increasing population base coupled with an expanding expatriate population is expected to drive demand for education across the region. An increased willingness of parents to ensure high-quality education for their children. The increase in income levels of individuals will have a cascading effect on the middle class population’s propensity to spend on education of their children, thus driving demand for private sector education (see graph below). Rising participation from operators and investors in the private school segment, which is relatively under-developed, across the region. Moreover, higher quality of education provided by private schools in the GCC is stimulating migration of students from public schools to the private counterparts. Despite the higher fee structure, private schools offering international curriculum are extremely popular among the growing expatriate population in the GCC, which has resulted in a number of international schools mushrooming in the recent past. These expats are looking “to pursue higher education in world-class private colleges after completing their schooling in private schools. Hence, establishing foreign universities in the GCC [also] helps to expand enrolment within the GCC,” Sanjay Vig, Managing Director of Alpen Capital, explained. The region has witnessed the establishment of several foreign affiliated universities and branches of foreign universities in the recent past. This trend is likely to enhance the quality of higher education in the region, further establishing the Middle East as an education hub. For example, in Qatar, to expand the reach of higher education by inviting in foreign universities, the government established Education City, which included nine global universities by 2011 and Northwestern College of Media and Communication is expected to open in 2013. The GCC region has witnessed the migration of students from other MENA countries mainly on account of easy access to better quality higher education institutes. The region has seen increasing use of technology in the education sector in the recent past. This is likely to improve the quality and teaching methods of education in the future. 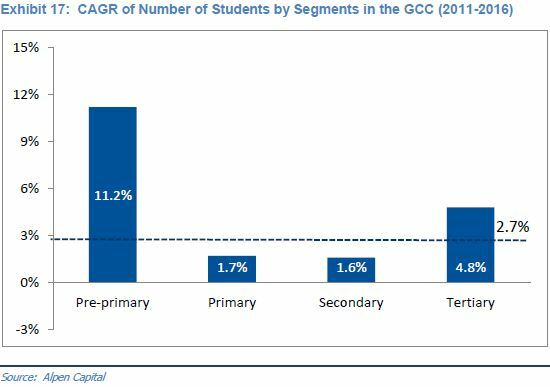 The GCC private education market is highly fragmented, and thus providing substantial opportunities to the existing operators to consolidate and develop economies of scale. The high willingness to spend on education is expected to translate into robust growth rates for private sector schools in the region. As per the Booz & Company and YouGov survey and illustrated above, the future willingness to spend on education for both nationals as well as expatriates is high. 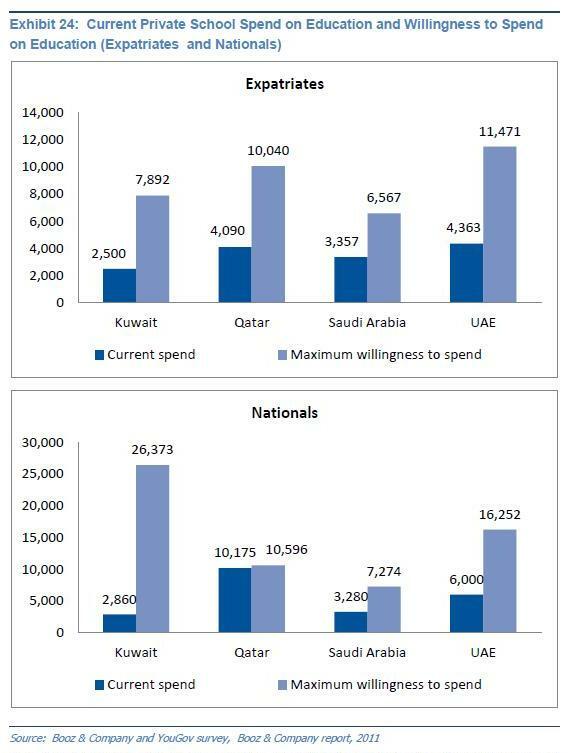 Kuwait, Saudi Arabia, and the UAE nationals are likely to increase their spend on private schools significantly as a result of growing awareness of quality education; while expatriates of Kuwait, Qatar, Saudi Arabia, and the UAE are also likely to do the same on private education. This is expected to translate into robust growth rates for private sector schools, particularly in Saudi Arabia, where private school enrolment is still very low as compared its counterparts in the GCC region. Shortage of skilled teachers remains the biggest challenge for the education sector across the GCC, which is expected to pose a serious threat particularly for private school operators to maintain the quality of education provided by them. The enrolment rate in the higher education segment remains very low in the region as compared to the developed nations, reflecting a mismatch between skills taught to graduates and requirements of the labor market. The region has witnessed a lack of opportunity for fresh graduates mainly due to lack of tie-ups between the education sector and the private companies in the region. This is likely to have an effect on the unemployment rate of the region. Strict financing environment in the region, particularly after the economic recession, has resulted in difficulty to procure funds for new ventures. Setting up a school involves not only a high capital requirement, but also high running costs. The tuition fee increases, however, are regulated by the government and private schools do not have the flexibility of changing the fee structure in line with their higher costs. This proves to be a challenge for investors in the higher education space. Investors are also currently faced with strict government regulations with respect to granting of licences. For instance, in Saudi Arabia licenses to run higher education institutes are not provided to overseas operators. Instead, in order to participate in the sector, overseas players have to enter into management contracts with local Saudi education providers. This entry was posted in Bahrain, Higher Education, K-12, Middle East, Oman, Qatar, Regions, Research, Saudi Arabia, UAE, Vocational and tagged vocational studies, student mobility, branch campus, blended learning, tertiary education overseas.